1 Magic Leap One now available in stores – but you’ll need a plane ticket to get to one. AT&T has announced that three of its U.S. stores will be selling Magic Leap One Creator Edition AR headsets starting April 1, and while you are there you can don a Magic Leap One to take on a White Walker as part of a Game of Thrones mixed-reality experience. But to do that, you’ll have to travel to its flagship store in Boston, Chicago or San Francisco, for now. While limited, it’s the first time the $2,295 Magic Leap One will be available in physical stores since its launch last fall. Until now, it has been sold online and will continue to be. “AT&T’s investment in 5G will enable the widespread adoption of emerging and innovative technologies like Magic Leap’s spatial computing and will help to redefine how we access and experience everything from work, play, communication, media, healthcare and education,” said Rony Abovitz, CEO of the Plantation-based Magic Leap, in a statement. AT&T does intend to bring Magic Leap into its 5G future, but it’s not here yet – and you may need to wait for Magic Leap Two for that. “We are preparing for a 5G future by bringing 5G to the Magic Leap campus later this year, so developers can innovate in near-real-time on a live 5G network. 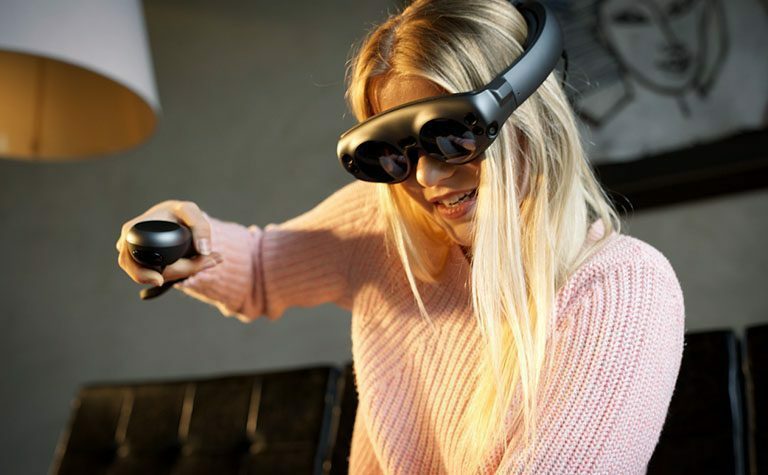 Additionally, Magic Leap is an initial participant in the AT&T 5G innovation Program, where they are working with us to develop ideas and test use cases on our live mobile 5G network,” AT&T said in a blog post. More to come from this partnership, AT&T said, including a DIRECTV NOW Beta on Magic Leap in addition to the CNN branded experience currently available. 2 Tech job demand is growing – but challenges remain. It’s in the numbers. Year over year, tech employment in the Miami-Fort Lauderdale metro area grew 3 percent, with an increase of 4,262 jobs from 2017 to 2018, solidly besting the national rate of 2.3 percent during the same time period. Against the 46 metro areas studied nationally, South Florida ranked in the top half or top third, ranking 19th nationally for the number of jobs (148,489, including the self-employed) and 15th for tech job growth. Tech job postings were up 130 percent year over year, for a total of 43,608 in 2018. That’s a pace nearly doubling the growth in job postings nationally. South Florida’s tech workers account for 5.3 percent of the overall workforce in South Florida. The good news in that stat is it is up from just 3.7 percent in its 2016 study. But here’s the rub: Of the 46 metro areas CompTIA studied, only three had a lower rate than Miami: Memphis, Las Vegas and New Orleans. CompTIA estimated the economic impact of tech employment at 7.2 percent or $22. 3 million, but it ranked 33rd of the 46 metro areas. The median wage for technical jobs in South Florida was $67,820, Not only did the figure trail the state’s median at $69,226, it trailed the national median wage of $81,900. For software developers specifically, the median wage in South Florida was $85,335. The national median was $100,880. The South Florida metro area has 8,737 tech firms, about 600 more than reported in the study four years ago. Two developments this month point to stronger startup ties between Israel and the Sunshine State. This week, Startup Nation Ventures and Orlando-based private equity firm Merging Traffic announced the launch of the $25 million StartUp Nation Ventures Fund. The fund will focus on disruptive Israeli technology startups ready for expansion into the United States and Latin American Markets. The fund will focus on investment in Israeli technology startups aligned with Florida’s High-Technology clusters like Cyber Security, Tourism, Blockchain, Medical Technologies (MedTech), Financial Technologies (FinTech), Smart Cities, eSports, and Gaming. More info about Startup Nation Ventures is here: www.sunv.io. And earlier this month, UC-Care, a medical technology company that was in the 2018 Florida-Israeli Business Accelerator (FIBA) program, received a $1 million investment from Florida Funders. The company, with 18 employees, offers two FDA-approved medical devices. One is for more accurate diagnoses of prostate cancer and a second is a solution for labs to more safely and cost-effectively process soft tissue biopsies. This is the second major investment to a FIBA company: in 2017, Tampa Bay Lightning owner Jeff Vinik invested $6 million in medical firm StemRad. To date, FIBA, based in Tampa Bay, has put 28 Israeli companies through its accelerator. Grand Capital Ventures acquired Yuka Clothing, an e-commerce company based in the North Miami. Yuka will be a wholly-owned subsidiary of Grand Capital Ventures and its principal operating company. Terms of the deal were not disclosed. Yuka is an e-commerce company that provides strategic sales channels for brands looking to enter or expand in the global e-commerce market, according to the news release. Services offered include sales and marketing, product and brand photography and operational sales and fulfillment logistics.